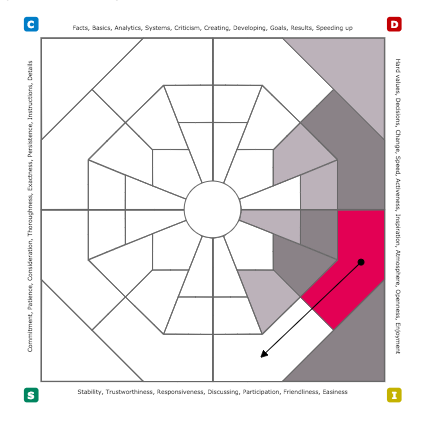 The Extended DISC® Assessment provides two profile graphs describing a person’s reaction mode to stimuli in their environment. Both Profiles are based on results of the person’s Extended DISC® Personal Analysis Questionnaire. Extended DISC® Profile I identifies the person’s perceived need to adjust and Extended DISC® Profile II identifies the person’s natural behavioral style. Profile II helps identify who the person is and their unconscious self-image. The results of Profile II are usually stable, but not rigid. Profile II results tend to be steady; whereas we expect Profile I, Perceived Need to Adjust, to change according to the current environment. Profile I identifies the person’s belief of success if they are to make behavioral adjustments in their present environment. It illustrates how the person feels they need to manage their behavior to better cope with current environmental pressures. Think of Profile I as a snapshot of how the person felt they needed to adjust their style at the time they took the questionnaire. Another way to think of Profile I is to imagine the person who shows up on the first date or the first job interview. They want to put their best foot forward and are consciously thinking about how they are coming across. Now think of Profile II as your spouse; the person you wake up next to, 20 years later. We, as coaches and trainers, want to focus 99% of our energies on Profile II (who you really are) and only 1% on Profile I. Profile II is what we need to know and Profile I may be nice to know. Profile I can help you understand if your perceived need to adjust are the right adjustments needed for your position, situation, etc. Profile I cannot be interpreted independently. It has no interpretation unless it’s compared to Profile II. The comparison identifies adjustments the respondent feels they need to make in their present environment to be successful. 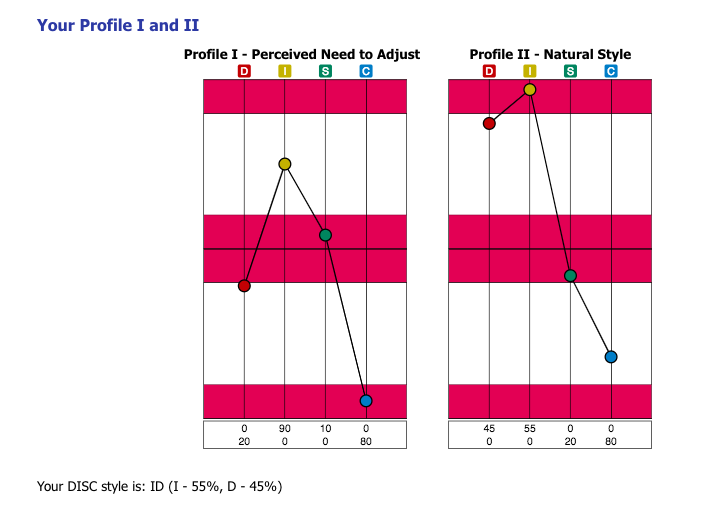 In order to interpret Profile I accurately we need to first look at Profile II – Natural Style (example above). This person’s Profile intersects at the I-style axis and the D-style axis above the middle line/mid-point; denoting I-style and D-style as the person’s natural styles. Now, in comparing Profile II to Profile I, one of the most obvious adjustments happens to the D-style. There are other small changes, but the D style dropping below the middle line is a significant change. This person expresses a perceived need to downplay their D-style. The person perceives a lack of motivation or value for D-style behaviors in their present environment. On the Extended DISC® Diamond, Profile II is identified as the starting point of the arrow (dot). Profile I is identified by the tip of the arrow. The direction of the arrow shows how significant an adjustment the person feels they need to make. In the example above (same results as the Profiles example above) the arrow shows an adjustment downward and away from the D-style quadrant toward the people-oriented I-style and S-style quadrants. The person identifies a perceived need to stretch outside of their comfort zone. The length of arrow helps us understand the amount of energy needed to make the adjustment. We don’t know if this person will actually downplay their D-style, but they perceive a need to. However, we must be careful of jumping to conclusions, as it can lead us down the wrong path. * In presenting results, we can provide the person with D-styles descriptors like, ‘fast-paced’, ‘decisive,’ and ‘direct’ to help them better understand the shifting behavioral styles. An effective way to finish up with delivering the results is to ask them open-ended questions like, “tell me more about what resonates with you?” Now, let them speak. This person lives Profile I and II everyday. They can give the true explanation as to what the results mean. As coaches, we can use the DISC assessment as an opportunity for the person to talk more in a clearly defined and non-judgmental framework of the DISC model. It can help them unlock the information and talk about it more comfortably, by providing them with general DISC style terms. In order to use our tool to its fullest potential, we should constantly be modifying our Profile I. While Profile I can provide additional insight into the person’s results, the big picture is to focus your analysis on Profile II. Profile I is their belief that if they made adjustments to their natural style they would be more successful. We don’t know if they will actually be more successful, nor do we know if they will actually make the adjustments. On the other hand, Profile II is who the person truly is and how they tend to show up. If we have concrete information about the person’s behavioral style then sound decisions can be made about adjusting behaviors. The end goal is to modify our behaviors effectively to improve communication, interactions, and relationships. *Training further enhances interpretation of results. Interpreting results without a good understanding of how to read the information is not recommended because of possible misinterpretations.